Hi - just poking around but not in the market for a camera, I see this full-frame camera at a "reasonable" price. From what I can see it may have been introduced a number of years ago, but maybe it was the first generation. So I'm just looking for an opinion or two from one or two people who are really familiar with Canon cameras. An aside: What I've been doing is trying to pick up good condition/reasonably-priced flashes and lenses before I even think about dropping a grand+ on another camera. Nothing EF-S, even though I currently have a cropped-sensor body (Canon T3i) which I am very happy with for what I am doing. The 5D was ground-breaking ... it offered 11 megapixels (same as the original 1Ds), but with better high-ISO noise. Suddenly 1600 ISO wasn't crazy high -- images looked great. So it brought high-resolution to the masses at an affordable price ... with great high-ISO noise. The original 1Ds in itself was hound-breaking. This was the high-resolution digital camera (11 megapixels) that was the tipping point where Hasselblad cameras lost their value as most photographers shifted to digital. The 5D mark 2 improved on the original 5D. It offered 1080p video. Higher resolution and better high-ISO noise. It's a great camera ... but dated by now, compared to the 5D mark 3. Summary: If you can get a good condition 5D mk2 at a good price ... and you were thinking of moving up, this would be a good entry point. Thanks, Neil. I do see some websites offering them "New". Should I have any concern about this, as you write they are "dated", and/or country of origin? I'm assuming if it's new-in-box, it may be some sort of overstock? If they say it is new, it most likely is. When I say "dated", I meant that the 5D mk3 has updated features and capability. OK, so this is a little messed up, in my opinion. I found a site that is selling brand new 5d MK 2s for $969 (something like Daxmart, I forget, I have it bookmarked in work). Just now, I found a site "Nerd Electronics", that is selling brand new 5D MK 3s for $750. Scam? How can this be? I'm not ready to pull the trigger on another camera, but I have been looking. How can the prices be like this? The price for the MK 2 is really low, but the MK 3? be VERY careful with Daxmart. Do a Search of their company. They have changed names many times...VERY VERY POOR overall rating...They are famous for Bait and Switch, and charging you for every little item that the camera should come with...Do a Google search on them and find out for yourself. Some have had good luck with them, most have not! Thanks, Penn, I appreciate the heads-up. I have to check tomorrow to see if that's actually the name I have bookmarked. Ron was a little 'polite' in his post, me, I say run like a bloody big brown bear was chasing you. It sounds like we are trying to save a buck by buying used Canon 5D Mark II and some here might be considering unauthorized retailers...nope dont do it. Many of my various bits of photography gear have been repaired or replaced under warranty. My Sigma 120-600mm is right now in Japan getting worked on under warranty. The focus suddenly stopped working. I remember by Canon Speedlight and Canon 24-70 2.8 II going in for warranty work a few times. The Canon 580 EX II was back so much for warranty work I sold it on Ebay when the warranty was up. I feel like Ive become an expert on the surrounding geography of that Canon repair depot in NJ having visited it a number of times. Also have visited Sigmas facility on Long Island a few times too. So do not buy the 5D Mark II. Get the 5D Mark III from an authorized retailer. Looks like street prices are right now $2199 for it...thats $2199 from an authorized retailer. From the unauthorized retailer its 1999. This isnt a car where you can get repaired at any old place. There are a few places qualified to work on the Canon bodies and all charge quite a bit. If its not under warranty, you are stuck... Its not worth it trying to save a few bucks. There is a secret to the Canon repair depot. The Canon repair depot has no way of telling where you bought the camera body from. They will honor the warranty if you present a receipt from either an authorized or unauthorized retailer. However, their stated policy is you must buy from the authorized retailer. Their unofficial policy which they will not admit to is they will work on all Canon cameras no matter where the receipt states you bought it from. only because I saw an ad from this place, and the price was questionable. There is the Canon 6D for $1239 which is the street price. It lacks the focus system of the 5D Mark III and it doesnt have the joystick. I cant live without a joystick so the 6D is not for me. However, the 6D is full frame capable of shooting photos just like the 5D Mark III. There will be another price drop on the 5D mk3 and 6D when the new versions are released, do you know it that is fairly imminent Michael? If soon is six months from now, its pretty soon. My expectation is for an announcement in the 4th quarter and ship in 1st quarter. It did seem like yesterday it was January and so time will probably move just as fast and those six months will be on us like that. However, if the man needs a body he needs a body. Knowing what I know about photographers and the equipment...used equipment is not where its at. If you buy a used Canon 5D Mark II its probably seen many many wedding seasons and the photographer is getting rid of it because it started to show problems. So you think you are saving a dollar but when something fails...you are not saving a dollar anymore. Lets hope it doesnt fail during the event. So, how would the "inferior" (for lack of a better term) focus system of the 6D compared to the 5D MKII affect what I mostly shoot - events. I take a lot of candids and I would think I need a good, fast, reliable, etc. focus system. I haven't yet looked into the details of either camera's system, so bear with me. If anyone could comment, it would be helpful. Thanks Michael, it will be interesting to see how the price point is affected of the current 5D and 6D cameras. Dbruno, it was the 5D mk3 (not mk2) and 6D that Michael was comparing. The 5D mk3 has 61 focus points and 41 of them are cross type whereas the 6D only has 11 and only the centre one is a cross type point but it does focus down to -3ev and the 5D3 goes to -2ev. The 6D doesn't have the joystick that the 5D has, so its horses for courses if you shoot lots of action then the 5D3 is the camera of choice (or the 1D series for ultimate speed). If you're not shooting action then the 6D will take equally great pics. Give any camera great light and you'll get great shots, full frame comes into its own when light conditions aren't so good and you can take advantage of the much better iso performance. The joystick was something I absolutely cant live without personally speaking. I got a hold of a 6D and it just didnt seem right without the joystick. Sounds like something trivial, but its pretty big for myself. The 6D will take the same pictures as the Canon 5D Mark III, but I dont like the controls personally. Whatever camera you get, you will make it work and find a way. The question to ask is about the Canon 6D Mark II. I could be wrong about my assumptions keep in mind. I am thinking the next 6D Mark II will be the general full frame camera much like the 5D Mark III is today. The 5D Mark IV (and there may not be a 4 because thats an unlucky number in Asia) will probably be a more sports oriented camera with higher ISO, but less megapixels. I just got the EOS M3 24 megapixel APS-C and I most appreciate it over its 18 megapixel counterparts. Seems sharper, pictures more detailed and crops make for a better picture. I would probably get the Canon 6D Mark II over the 5D Mark IV. The Mark IV I think will be more of an Olympic camera, but I dont shoot the Olympics. I dont need every ounce of ISO I can get a hold of. I would rather have more detailed pictures and pictures I can crop a little more than I usually do. TonyT - Thanks for the info. I'm not really sure what the joystick is, so I will have to look at photos. Is it the "wheel" you are both referring to? without having to look at a menu and 'select' one. I could not work without a joystick, that's for sure. Trev - Thanks. I suppose you would need one for all those AF points. 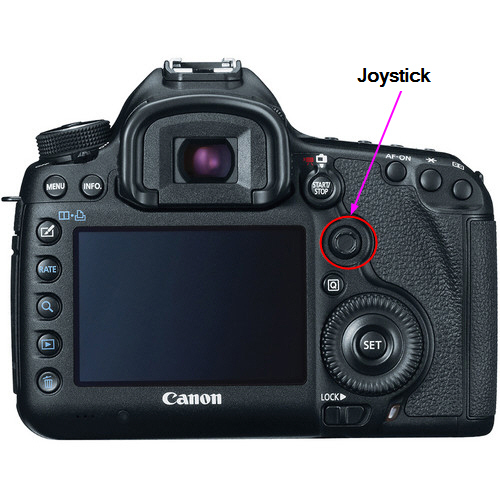 With the Canon 6D, there is a rocker switch within the thumbwheel (around the SET button), which acts like the joystick. So it isn't as if you're entirely without the same control with the 6D.